Just a quickie today, but I got batteries for the camera, plus Daisy was off the snaps for some traveling today so I figured I'd take the opportunity to share. :) For some strange reason blogger is doing that weird rotating thing again, I have no clue why. The fully stitched part is the top!! Not that it really matters, the design is symmetrical apart from my initials! 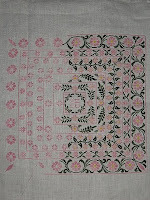 Getting closer to finishing as you can see, if only I could concentrate on stitching. Put in one flower last night and then just didn't feel like it. I'm thinking maybe I should work on something else for a few days to get my mojo back. Now the question is... what to work on? 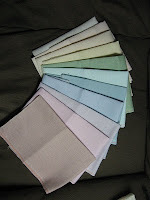 And just because, I snapped a picture of my fabric rainbow. This is all Belfast Linen, fat quarters of each colour, and there should be enough here to stitch all of the Nora Corbett Flower Pixies (the ones I plan on stitching anyway). :) Not sure which colour will be for which design yet, but I wanted soft pastels that wouldn't overpower the designs. And it rotated this one too. ARGH!! Doesn't it look yummy though? Reminds me of ice cream. Okay. 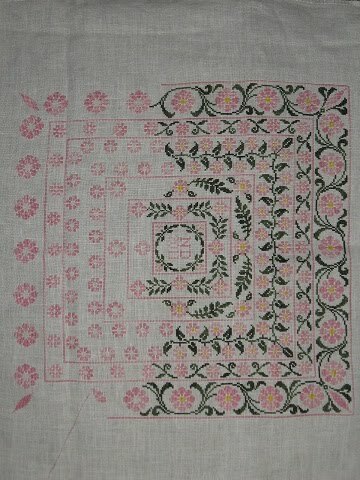 Off to figure out what to stitch. Oh, Daisy looks lovely! And I love all the fat quarters! They are all so pretty!